HONOLULU – The U.S. Supreme Court today unanimously denied a motion by the Akina plaintiffs to stop a gathering of Native Hawaiians at an ‘aha scheduled for February. The motion for contempt was filed by the Akina plaintiffs when Na‘i Aupuni terminated the election of delegates and instead offered all candidates terms to participate in an ‘aha to discuss a path to self-governance. The Na‘i Aupuni Board of Directors decided that the ‘aha will convene for four weeks in February and will involve more than 150 participants from Hawaii, the continental U.S. and other countries. Information on the presenters, as well as readings for participants on the discussion subjects, can be found on the Na‘i Aupuni website: naiaupuni.org. Na‘i Aupuni is an independent organization made up of a volunteer board of directors from the Hawaiian community. It exists solely to help establish a path to an ‘aha, where Hawaiians can discuss and explore various options of self-determination. Na‘i Aupuni was formed in December 2014 and is separate and independent from the Office of Hawaiian Affairs and the State of Hawaii. Further information about Na‘i Aupuni and the ‘aha can be found at http://www.naiaupuni.org. This entry was posted in Candidate, News on January 20, 2016 by Blaine Fergerstrom. HONOLULU – Na‘i Aupuni today announced the names of 152 Native Hawaiians who will take part in an ‘aha, a gathering to broadly discuss self-governance, in February 2016. The ‘aha participants come from the 196 former candidates who stepped forward to run in an election that would have sent 40 of them to a constitutional convention. Na‘i Aupuni terminated the election on Dec. 15 because pending litigation would potentially have stalled the counting of the vote for years. Na‘i Aupuni, instead, offered all of the then-registered candidates terms to participate in a gathering to discuss self-governance. A total of 152 participants had signed on for the ‘aha by the deadline of midnight yesterday. “Every former candidate had an opportunity to participate and we are excited that a large group of committed persons who represents a broad cross section of the Native Hawaiian community, both in Hawaii and on the continent, will have an opportunity to discuss self-governance,” said Kuhio Asam, Na‘i Aupuni president. “Our goal has always been to establish a path to an ‘aha where Hawaiians can have a long-overdue discussion on the future of the Hawaiian people. A component of the month-long ‘aha includes the discussions the participants will engage in with experts during the first week regarding constitution building; federal Indian law; international law regarding de-occupation, decolonization and the rights of indigenous people; U.S. Constitution issues that relate to Native Hawaiian self-governance; ceded lands; and Kingdom Law. Peter Adler and Linda Colburn of The Mediation Center of the Pacific will serve as facilitators to lead the discussions with the experts and to assist the participants in organizing themselves. Thereafter, whatever happens at the ‘aha will be completely up to the participants without interference by Na‘i Aupuni or any government entity. A list of the participants to the ‘aha is attached. Na‘i Aupuni is an independent organization made up of a volunteer board of directors from the Hawaiian community. It exists solely to help establish a path to an ‘aha, where Hawaiians can discuss and explore various options of self-determination. Na‘i Aupuni was formed in December 2014 and is separate and independent from the Office of Hawaiian Affairs and the State of Hawaii. Further information about Na‘i Aupuni and the ‘aha can be found at http://www.naiaupuni.org/. This entry was posted in Candidate on December 23, 2015 by Blaine Fergerstrom. This entry was posted in Candidate on December 15, 2015 by Blaine Fergerstrom. Click here to view Hawai’i Island Candidate Craig ‘Bo’ Kahui’s profile page and to review his survey responses. This entry was posted in Candidate on December 9, 2015 by Blaine Fergerstrom. HONOLULU (AP) — The U.S. Supreme Court is blocking votes from being counted in a unique election that’s considered a major step toward self-governance for Native Hawaiians. The high court on Wednesday granted an injunction requested by a group of Native Hawaiians and non-Hawaiians challenging the election. They argue Hawaii residents who don’t have Native Hawaiian ancestry are being excluded from the vote, in violation of their constitutional rights. The order blocks the counting of votes until at least the 9th U.S. Circuit Court of Appeals issues its ruling on the lawsuit challenging the election. The court’s four liberal justices say they would have allowed votes to be counted pending the appeal. A justice’s ruling last week blocking the vote count prompted election leaders to extend voting to Dec. 21. 15A551 AKINA, KELI’I, ET AL. V. HAWAII, ET AL. The application for injunction pending appellate review presented to Justice Kennedy and by him referred to the Court is granted. Respondents are enjoined from counting the ballots cast in, and certifying the winners of, the election described in the application, pending final disposition of the appeal by the United States Court of Appeals for the Ninth Circuit. This entry was posted in News on December 2, 2015 by Blaine Fergerstrom. 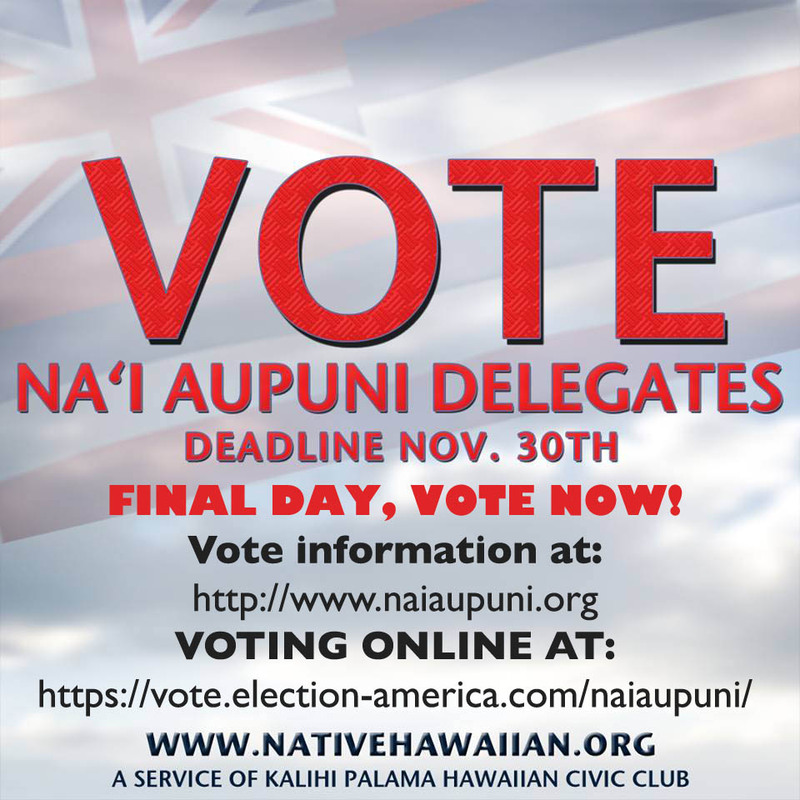 HONOLULU – Na‘i Aupuni, the Native Hawaiian organization with a mission to establish a path to Native Hawaiian self-determination, announced today it is extending the deadline to vote to December 21. “Because voters may not have cast their ballots over concerns and questions on the recent U.S. Supreme Court’s (SCOTUS) decision to temporarily stop the vote count, we are extending the voting deadline to December 21, midnight Hawaii time,” said Bill Meheula, legal counsel for Na‘i Aupuni. The SCOTUS decision temporarily stayed the vote count and certification of the elected delegates, but did not stop voting. Na‘i Aupuni is confident the court will find in their favor. “We feel strongly that the Supreme Court will agree with Judge Seabright that the plaintiffs are not entitled to enjoin our election. We urge voters to use this extension to participate in this opportunity to unify Hawaiians,” Meheula added. Na‘i Aupuni also wanted to remind voters the protest by some against the ‘Aha process are based on unfounded fears of loss of the ceded land and any chance of independence. “Nothing is predetermined about the ‘Aha. This is an opportunity to talk about all forms of government, including independence and any recommendation will be taken back to the voters,” said Meheula. This entry was posted in Candidate on November 30, 2015 by Blaine Fergerstrom. This entry was posted in News on November 29, 2015 by Blaine Fergerstrom. Kelii Akina, the president of public policy think-tank Grassroot Institute of Hawaii and a plaintiff in a lawsuit challenging a Native Hawaiian election, speaks to reporters outside U.S. District Court in Honolulu last month. A U.S. Supreme Court justice on Friday issued a temporary stay blocking the counting of votes in an election that would be a significant step toward Native Hawaiian self-governance. Nai Aupuni, the nonprofit organization guiding the election process, is encouraging voters to continue casting votes, said Bill Meheula, an attorney representing the group. A group of Native Hawaiians and non-Hawaiians is challenging the election, arguing Hawaii residents who don’t have Native Hawaiian ancestry are being excluded from the vote. They argue it’s an unconstitutional, racially exclusive process. This entry was posted in News on November 27, 2015 by Blaine Fergerstrom. This entry was posted in News on November 19, 2015 by Blaine Fergerstrom. Walter Ritte, center, publicly disenrolled on Oct. 28 from the Native Hawaiian Roll and withdrew his candidacy from the Na‘i Aupuni Native Hawaiian election and convention, calling for a boycott of the election. Alika Desha, left, of the Royal Order of Kamehameha I, gave his support to Ritte, with Ritte’s wife, Loretta. The organization supporting the Native Hawaiian election said today a challenge to the seating of delegates to a constitutional convention has been rejected by the Ninth Circuit Court of Appeals. Na‘i Aupuni, formed as an organization independent from the Office of Hawaiian Affairs and the state, issued a press release this morning saying the appeals court decision means the election can go forward. “The federal appeals court ruling means that the voting that currently is underway by about 89,000 certified Native Hawaiians can continue,” Na’i Aupuni said in a press release. The election concludes on Nov. 30 and will seat 40 delegates to the constitutional convention, or ‘Aha, in February. Election results will be announced Dec. 1. A group of both Native and non-Native Hawaiians had sued to prevent the election, saying it’s unconstitutional to restrict voting to only Native Hawaiians, and U.S. District Judge J. Michael Seabright ruled in October that the election could go forward. “The Ninth Circuit has correctly rejected the Grassroots Institute’s second legal attempt to stop the election of delegates, said Na‘i Aupuni attorney William Meheula. “This process will empower 40 Hawaiian delegates to make recommendations on self-governance and any such recommendation will go back to the voters for ratification. For those who have expressed concern about the Na‘i Aupuni process, Na‘i Aupuni directors understand that these are important and sensitive issues, and they ask the voters to consider that the courts have rejected those concerns and to believe in the collective wisdom of the voters and candidates,” Meheula said.